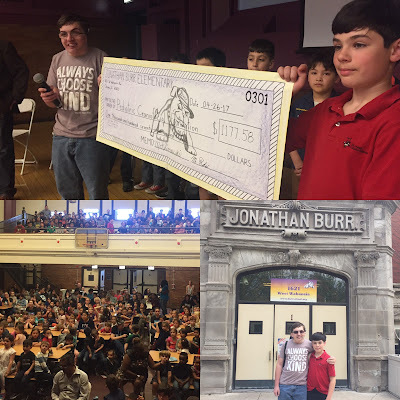 Children's Craniofacial Association would like to thank the Burr School in Chicago, Illinois for jumping on the kindness train. We are grateful for their acts of charity which all began after they read the book Wonder. Thanks to their "penny war," where all of their classrooms squared off placing pennies in jars, they raised over $1100 for the Pediatric Craniofacial Foundation in just two weeks. There next charitable goal is to fundraise for a CCA Starfish Scholarship, the funds raised for the scholarship would allow a family to attend the CCA Annual Family Retreat at no cost. Learn more about the Starfish Scholarship here. "We watched the Dankleson's on WGN-TV's morning program, I contacted them about the possibility of speaking at our school. In the past our school has had a theme for the school year, this year's theme was #EmbraceDiversity. 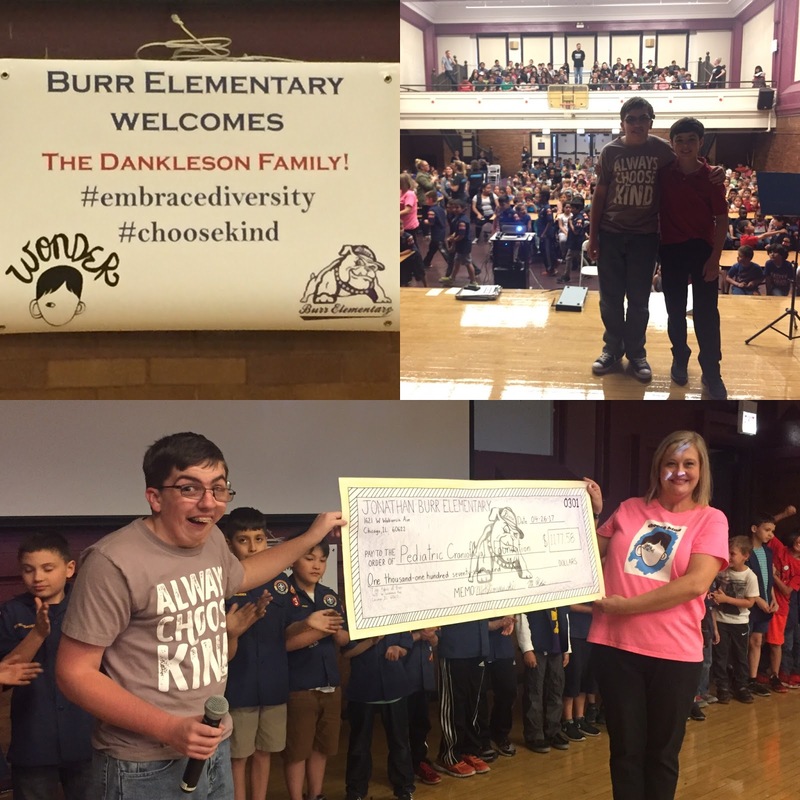 Last school year our theme was #ChooseKind. To start off our summer reading program, we purchased for every student in 3rd through 8th a copy of the book Wonder to read. Since reading the book we have adopted the #ChooseKind in our everyday lives. After everyone had read the book, the Dankleson's were awesome enough to have a school-wide assembly for our children. It was wonderful! Pictures appear below from their visit to our school. All they asked in return was a donation to the Pediatric Craniofacial Foundation. We decided to have "Penny Wars," involving all our students to raise the money for the donation. For "Penny Wars" we gave each class a container to collect money. The pennies count as positive points, while silver and paper dollars count against the total. During a 2 week period, students jammed pennies in their classrooms' jars, and then tried to sabotage the other classrooms with silver and dollar bills. In that time we are proud to say that we were able to raise $1158.00!